The Knights Templar, a military order of the Roman Catholic Church, are back in the news again, almost 700 years after they were suppressed by papal edict. They were originally formed to protect Christians in the Holy Land during the early Crusades. 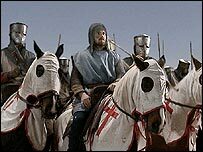 The Templars are the stuff of legend, and their exploits have provided the plots for many films and popular novels. The Knights, who wore a distinctive white mantle decorated with a red cross, became very wealthy, owned property all over Europe and the Middle East, and started up a primitive international banking system. They caused deep controversy, even in their own time. They helped to finance wars waged by several European monarchs. Some believe the Templars were the custodians of the fabled Holy Grail. Disentangling fact and fiction about them is difficult. In France, a Grand Master of the Order and other knights were burned alive by order of King Philip IV, after the Order was accused of heresy, blasphemy and sexual misconduct. Now the Vatican has decided to shed some new light on this often obscure period of late medieval history. To the delight not only of scholars but also of Templar buffs around the world, who have been captivated by Dan Brown's stories, they are publishing facsimile reproductions of the original account in Latin of the investigation and trial into the alleged misdeeds of the Knights Templar. It took place in Rome between 1307 and 1312. The document, known as the Chinon parchment, shows that Pope Clement V found the Templars not guilty of heresy, but guilty of other lesser infractions of Church law. Nonetheless he ordered the disbandment of the order. The Vatican's Secret Archives, one of the world's great repositories of historical documents, is selling a limited edition of 800 numbered copies of the Chinon parchment. It is printed on synthetic parchment, comes complete with a reproduction of the original papal wax seal, and is packaged in a soft leather case together with a scholarly commentary. Each copy will cost just over 5,900 euros ($8,000; �3,925). Rosy Fontana, spokesperson for Scrinium, the publishing and merchandising company handling the sale, says one copy will go to Pope Benedict XVI while most of the remaining 799 copies of this luxury limited edition have already been reserved by libraries and collectors around the world. Scrinium has already published two other digitally mastered and hand-finished collections of colour reproductions of precious documents from the Secret Archives. The Chinon parchment was recently rediscovered by Barbara Frale, a Vatican historian who works in the Secret Archives. She says she stumbled across the document in a box containing other papers five years ago, having been lost for centuries after it was wrongly catalogued. The document is half a metre (20 inches) wide by two metres long - the size of a small dining table. According to Ms Frale, one of the accusations against the Templars was that they practised blasphemous initiation rites such as spitting upon the cross. They justified this, according to the document, by claiming this was part of a ritual of obedience in preparation for possible capture by Muslim armies. Both the Vatican's Secret Archives, and its adjoining Library (at present closed to scholars while it undergoes restoration) are housed in Renaissance buildings not far from the Sistine Chapel. Together, the two collections of books, manuscripts, and letters cover tens of kilometres of shelf space, much of it underground for security reasons and to protect the archive against fire. The official archives of the Holy See were systematically organised for the first time only in the 17th Century. In the early days of the Church, popes did preserve manuscripts concerning their reign. But the fragility of papyrus documents used before the invention of paper, and the frequent changes of residence of popes before the 11th Century, means that most of the earliest Church archives have been lost. Among other treasures from the Archive, sometimes shown to VIP visitors, are letters from King Henry VIII of England to Anne Boleyn, his future wife, stolen from London by a Vatican spy to provide evidence of the King's disloyalty to Rome. There is also correspondence between Lucrezia Borgia and her father Pope Alexander VI. There are no immediate plans for the publication of any of these unique documents. Most Popular Now | 24,229 pages were read in the last minute.